Like Wrendale? Click here to view the entire range. 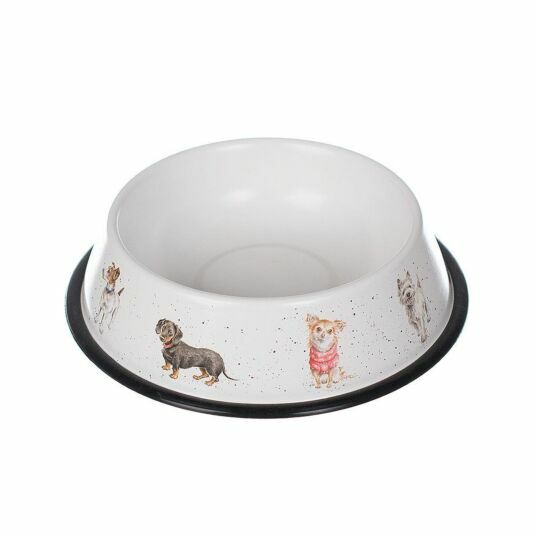 Treat your favourite furry friend to a new feeding bowl with this beautifully illustrated Dog Bowl, the perfect accessory for man’s best friend. The bowl can be used as a water or food serving bowl. It is made from high quality galvanised steel; ensuring even the hungriest of dogs won't break it! The light cream background of the bowl is decorated wtih delicate and beautiful illustrations by Wrendale’s designer, Hannah Dale, with a range of our nations favourite breeds. Dogs and puppies from many different breeds are delightfully depicted around the outside of the bowl. The bowl itself is finished with a rubber banding around the bottom rim to keep it from slipping on hard surfaces. This Wrendale Illustrated Dog Bowl would make the perfect gift for your pet dog, or any dog of your acquaintance!